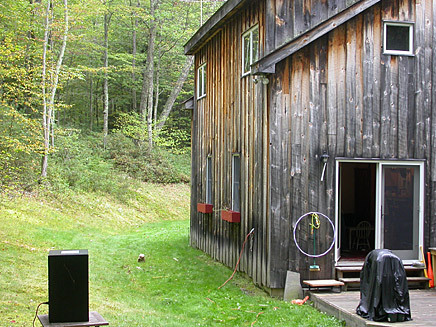 October 2005 Matt Snedecor and I, Arjen van der Schoot, took to Kerhonkson, NY at the foot of the Catskill Mountains. Armed with a Genelec 1032 running on a car battery, a laptop, the DPA's and a mobile IO we were to have a go at a series of outdoor IR recordings. It was supposed to be cold like it had been the week before. Cold makes the bugs shut up. This night was nice and warm, and much of our recordings turned out to be unusable. We stayed the night in the country house of (Emmy nominated sound designer) Coll Anderson. He wasn't there himself, but the living room sounded pretty nice he told me. He actually recorded a band in there once and got good reviews for it. I agree. Coll's living makes a very nice drum room. We sampled it thoroughly for music purposes. Next Morning Matt and I recorded a series of 'Next Door' samples: IR's where the speaker and microphones are in different rooms, separated by floors, doors and walls. So take the tour of Coll's house. No bugs inside. Enjoy.